Advanced Web Development by AskApache is a Firefox Collection I created for myself to make finding and installing my favorite Firefox Add-ons simple and easy. As this screenshot shows, I only use a handful of add-ons at a time. These buttons allow me to clear the DNS/Cookies/Cache for whichever site I'm on when I click it. Very very helpful for me as a web designer. The 4th button there is just a restart button. Other than those, Firebug, YSlow, LastPass, and Web Developer are the only ones I always use regularly. The more add-ons you have, disabled or not, the slower Firefox is. (unless you are running your profile folder in TMPFS). Also, bookmarks and settings like that have a performance hit. I have been using Firefox since it launched way back when, and I have always kept my bookmarks when moving to new machines and new installations.. So with over 5 thousand bookmarks I finally did some debugging and discovered that was a huge cause of Firefox acting slow. Now I am trying to migrate them all over to Google's Gmarks, which knowing Google will be awesome eventually. The solution to all these problems is to use separate Firefox profiles which use separate folders to store your profile-specific extensions and settings. So I have profiles with upwards of 40 Addons installed and enabled, and another profile that is built for speed... It's very very slow to be running Firebug and have multiple tabs open.. You can use the profilemanager to load them specific profiles from the command line. I personally use separate icons on my Windows Quick Launch that I just modified the shortcut pointing to firefox to also have the profile commandline. Note also that you can have multiple profiles open and running simultaneously.. This lets you do some crazy networking and other random hacks like having many Firefox instances running each of which is configured to use a separate SOCKS Proxy or network interface, so you can really open up those pipes for some intense txrx. ShareThis makes sharing any online content quick and easy. The ShareThis plugin allows you to share to any contact via email, text message, Facebook, Twitter and more. You can also store your shares for later to reshare with the ShareThis ShareBox. Adds a color picker to Firebug's CSS panel. When click on the selected tab, a history menu corresponding to it will display. Synchronizes your bookmarks, passwords and password exceptions between browsers. Uses your own (or third party) web or ftp server so you have complete control and privacy. Provides some additional capabilities to firebug to find inline code as opposed to external files. Another of my personal favorites, modifies the "Save complete page" option of firefox to truly be more complete, I don't understand why firefox doesn't already do this. The FireDownload extension for Firefox and Wyzo lets you manage and accelerate your web downloads up to 10x faster! With FireDownload, download acceleration is seamlessly displayed within the downloads window. Try the ultimate download accelerator! Pretty nice and unobtrusive download enhancer. Bookmark Sync "Bring Your Own Server" Edition (BYOS). For expert users who wish to sync their bookmarks and passwords using their own FTP or WebDAV server. a syntax highlighter, based on SyntaxHighlighter(http://code.google.com/p/syntaxhighlighter/), support lots of program languages. Adds syntax highlighting, somewhat intensive. Love this plugin, replaces the reload button with a look-alike button with a drop-down menu that lets you enable automatic reloading of a tab (or all tabs) and set the number of seconds between reloads. I've found it very useful for checking cookie behaviour and cache setups, its also nice if you want to keep checking a page for updates. Quickly resize your window to the common sizes to see what a site looks like for users with that resolution. Locate the fonts that are in use on a webpage. Small and unobtrusive. Adds jquery support, I usually keep disabled even though I personally use jquery for web development. Alexa Internet's official add-on for Firefox! Get Alexa data in your status bar. Shows the alexa rank of a site, I like it but it does make new HTTP requests for each page, so I disable it alot for privacy or speed. One of the newer add-ons I've been using. Lets you find which CSS rules are actually in use on a page, thus helping you to minimize and streamline CSS. Very cool but it is a little resource intensive so by default I keep it disabled. Use the documents colors or other. This is the only officially supported Bing add-on, provided by the Bing team in Microsoft. Bing is a search engine that finds and organizes the answers you need so you can make faster, more informed decisions. In the Firefox Browser (and other Mozilla programs) you can per default configure only the setting for one internet connection. With the MM3-ProxySwitch you can manage different configurations and simply switch over between these. If like me you often connect to websites by proxying firefox through SSH Tunnels, then you can use this MM3-ProxySwitch add-on to run 3 different instances of firefox (by using multiple firefox profiles) that EACH use a different Proxy. This is useful if you want to MAX out your download speed by downloading using multiple tunnels to do the work. Also useful for just plain multiple proxy configurations, very easy, and super extremely unobtrusive and low-resource intensive. One of my personal favorites, adds a tab to firebug that lets you view live cookies being set, deleted, and updated, and lets you edit, and delete cookies of a page LIVE. RESTClient is a firefox extension use to visit and test RESTful/WebDav services. Java Console Extension for Java SE 1.6.0_02 (version 6 update 2). Amazingly awesome add-on that scrolls rss feeds across a small area, helpful to keep track of various feeds and your own sites feeds. Displays previews of your tabs in your sidebar. I like this one more than the tab preview add-ons, lets me find a tab quickly but only when I want by opening the sidebar. CryptoFox is an encryption/decryption tool for Mozilla Firefox, with dictionary attack support for cracking MD5 passwords. Adds options to quickly bookmark all tabs in a window and store them in a bookmark folder that is given the date (and optionally the time) as its name. Simple image zooming functionality. Small and useful add-on. Just a shortcut to the about:cache area. The final caching add-on that I absolutely LOVE. Lets you add anywhere on your toolbar to clear the DNS cache of firefox. I have this, clear cache, and clear cookies next to each other on the far left of my bookmarks toolbar, I use them ALOT. Places a "Manage Folder" item on the context menu of bookmark folders, which opens the "Places Organizer" expanded to that folder. View Dependencies adds a tab to the Page Info window, in which it lists all the files which were loaded to show the current page. Torbutton provides a button to securely and easily enable or disable the browser's use of Tor. It is currently the only addon that will safely manage your Tor browsing to prevent IP address leakage, cookie leakage, and general privacy attacks. Quick way to switch firefox to use the TOR network (I recommend the free vidalia suite) which is useful for web developers that rely on an IP address in certain programming and setups. Tab grouping, vertical tab tree, multi-rows, and various tweaks for power users. A button you can place anywhere that restarts the browser just like you do after updating add-ons. This extension will enable you to organize your status bar icons. You can now rearrange or remove any item (icon or text) in the Firefox status bar. If your status bar is full and cluttered like mine was, give this a try. Lets you rearrange the items on the status bar. Very helpful and well-designed add-on that lets you backup your entire firefox, or individual add-ons, or both! Checks your bookmarks are valid and the pages still exist. Also checks for duplicates and for empty folders and can restore missing favicons. There's a new way to manage and find favorite add-ons. Comment, share, and sync collections, all from your browser. Lets you get updates and makes it very easy to browse a collection such as this one. Very unobtrusively makes the advanced google search operators available. Use Yahoo! and the web faster, safer, and easier with new mail notification, search suggestions, online bookmarks, free spyware scanning, and more... Save time with the new Yahoo! Toolbar 2.0, now in beta at toolbar.yahoo.com/beta. Email This! will send your recipient the link, title, & highlighted text of the page you are viewing using GMail, Google Apps GMail, Yahoo, and Stand-Alone Mail Clients like Outlook Express, Thunderbird, & More! If you hate toolbar buttons don’t fret because I've included a right-click pop-up menu and access keys! I have wanted this type of functionality for soo long. Cache View is a Firefox extension that displays Google's Cache, Coral's Cache, and Wayback Machine's Cache cache of an open tab or selected link via a right-click or the Tools menu. Useful to notice how often a page on your site is crawled and cached by these engines. Never lose anything you type into a web form again! Lazarus securely auto-saves all forms as you type, so after a crash, server timeout, or whatever, you can go back to the form, right click, "recover form", and breathe a sigh of relief. Saves your form data securely as you enter it, and provides a way to recover that form data if your firefox crashes (more likely windows crashes) and that way you won't lose anything you already entered. This will slow down firefox alot though. Adds wikipedia results right next to google results, very helpful to keep an eye on what is authoritative, and often get the best information fast. Tired of going to History -> Recently Closed Tabs just to undo a closed tab? Then this extension is for you! 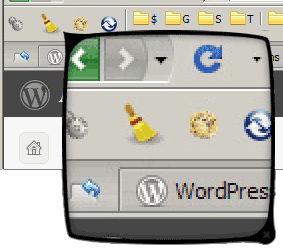 This extension allows you to undo closed tabs via a toolbar and/or tab bar button or the right-click context menu. One of my personal favorites, adds back the most recently closed tab, very helpful. Adds PNG favicons to some search engines and web directories, such as Google, Yahoo, Bing, Ask, Altavista, Wikipedia, AOL, Dmoz, Alexa, del.icio.us and others. This is helpful to get a better feel for search engine results by adding their sites favicon to the search results page, is somewhat HTTP Request intensive however. Adds a menu item in each sub folder of the bookmarks menu to bookmark the current page. Just as seen in the Opera browser. This is invaluable, it removes all the cookies from whichever domain you are currently viewing. Pretty awesome, lets you modify the HTTP Headers your browser is sending, useful to check accessibility, server settings, language settings, etc. OPML Support adds OPML import/export functionality to the Firefox Bookmarks manager. Super awesome cool. If your machine is fast this is a really helpful add-on. One of my long-time, all-time favorites that lets you view the source code of a website, but in a color-coded and formatted view. Very nice and helpful for (X)HTML developers. Not enough place on your bookmarks bar ?... Smart Bookmarks Bar extension comes right here by hiding bookmarks names and only showing icons. Bookmark names will be displayed on mouse over. For those who frequently use the bookmarks in the firefox bookmarks toolbar, this is a great way to show more in a cleaner way. Provides much more information unobtrusively on your statusbar, very cool! Email Yourself! allows you to email yourself the link, title, and a selected summary of the webpage you are viewing using GMail. This addon enhances all the tooltips in Firefox. "Multi smart search" displays a new context menu including all the installed search engine. Sorts your bookmarks in a variety of ways. Lets you block flash for all/specific websites/domains, which is pretty nice capability to test both your sites for non-flash viewers, and speeds up firefox. A great add-on that lets you use hundreds of google tricks and tools. Very helpful but also makes a lot of background HTTP requests so privacy-conscious or speed-freaks will want it disabled. DOM Inspector is a tool that can be used to inspect and edit the live DOM of any web document or XUL application. The DOM hierarchy can be navigated using a two-paned window that allows for a variety of different views on the document and all nodes within. Note: This add-on depends on binary changes to Firefox, and will not work with Firefox 2. Way to inspect the DOM of a page, useful for web developers. Enables multiple selections from Bookmarks Menu, History Menu, or Smart Location Bar (awesomebar) dropdown list, without reopening menu or using sidebar. Provides feature to close multiple tabs. An advanced java script console. Now this one is what I call genius. Lets you view previews of your bookmarks! Great if like me you have over a thousand bookmarks. LastPass is a free online password manager and Form Filler that makes your web browsing easier and more secure. LastPass supports IE and Firefox as Plugins (Opera, Safari, Chrome, iPhone, Opera Mini via Bookmarklets), allows you to import from every major password storage vendor and export too, captures passwords that other managers won't including many AJAX forms, and allows you to make strong passwords easily. Your sensitive data is encrypted _locally_ before upload so even LastPass cannot get access to it. One Time Passwords & Screen Keyboard help protect your master password. What can I say, this add-on is in my top 10 for sure, and I recommend it to all my friends and even my family. Lets me create very secure passwords for sites that I don't have to remember because lastpass remembers them for me, and stores them encrypted on both a usb medium I keep, and on their servers. So when I use someone elses computer or reinstall firefox, I have all my usernames and passwords, and its just sooooooooooooooooo useful. Get this add-on, it truly is a secure way to only have to remember 1 password from now on, thus LastPass. The last password you need. Tabs Open Relative makes all new tabs open to the right of the current tab, rather than at the far right of the tab bar (optionally this only applies to links). This stops that annoying default of opening tabs wayy on the right. One of the top 3 most important and helpful add-ons for firefox. Web Developers who don't use this one are simply irresponsible. A must-have add-on for anyone using CSS or developing websites, very amazing, highly capable add-on. The one issue is that is is somewhat of a resource-hog. This add-on is 1 of the top 2 most important add-ons for web developers. The other is firebug. By far, without a doubt, the single most important and valuable add on for ANY web developer. This is the one that is definitely required. The features are too numerous to name here. Very helpful for those that don't have and use wireshark. The most complete proxifying tool for firefox, multiple configurations possible. Adds a very unobtrusive way to check the pagerank, and several other SEO statistics but only when you click a button (if configured that way) very helpful occasionally. Very nice, easy, fast, and unobtrusive add-on that lets you download all files of a certain type to a certain save location, lets you use builtin filters or configure your own using basic REGEX. Very helpful. A button you can add to your toolbar that clears your firefox cache (not cookies or history) which is invaluable for web developers. Display Wolfram Alpha results in Google searches. No need to switch search engines when you can use both at once! The new search is a glimpse at the future of computing. Lets you go beyond firefox builtin menu editing and create a custom toolbar. Fire.fm gives you access to the extensive music library on Last.fm. Last.fm gives free radio to the US, UK, and Germany, plus subscriber-based service to the rest of the world. Listen to your favorite music and discover new artists in the process. What would work be without free streaming music that is customizable and recommends music based on your history. Conveniently can be added to your status bar, or your toolbar. StumbleUpon is great. Very cool way to see relevant and interesting web development articles and sites.